The Hardware group will be supporting the Beta Software testing by providing an EPROM -programming adapter for the TAPR TN C. This adapter connects to the parallel user port, and will enable the Beta Test site to program the 2732 EPROMs used in the TNC. It is expected that each Beta Test Coordinator will obtain one of these adapters for his particular Site and do the programming for his group. This will enhance the flow of software up-date information and free the Tucson group from excessive correspondence in this regard. 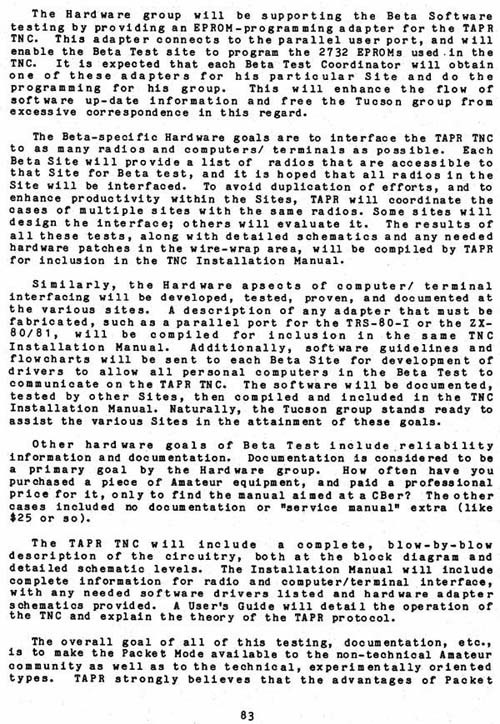 The Beta-specific Hardware goals are to interface the TAPR TNC to as many radios and computers/ terminals as possible. Each Beta Site will provide a list of radios that are accessible to that Site for Beta test, and it is hoped that all radios in the Site will be interfaced. To avoid duplication of efforts, and to enhance productivity within the Sites, TAPR will coordinate the cases of multiple sites with the same radios. Some sites will design the interface; others will evaluate it. The results of all these tests, along with detailed schematics and any needed hardware patches in the wire-wrap area, will be compiled by TAPR for inclusion in the TNC Installation Manual. Similarly, the Hardware aspects of computer/ terminal interfacing will be developed, tested, proven, and documented at the various sites. A description of any adapter that must be fabricated, such as a parallel port for the TRS-80-I or the ZX80/81 , wi11 be compi1ed for inclusion in the same TNC Installation Manual. Additionally, software guidelines and flowcharts will be sent to each Beta Site for development of drivers to allow all personal computers in the Beta Test to communicate on the TAPR TNC. The software will be documented, tested by other Sites, then compiled and included in the TNC Installation Manual. Naturally, the Tucson group stands ready to assist the various Sites in the attainment of these goals. Other hardware goals of Beta Test include reliability information and documentation. Documentation is considered to be a primary goal by the Hardware group. How often have you purchased a piece of Amateur equipment, and paid a professional price for it, only to find the manual aimed at a CBer? The other cases included no documentation or "service manual" extra (like $25 or so). The TAPR TNC will include a complete , blow-by-blow description of the circuitry, both at the block diagram and detailed schematic levels. The Installation Manual will include complete information for radio and compute r/terminal interface, with any needed software drivers listed and hardware adapter schematics provided. A User's Guide will detail the operation of the TNC and explain the theory of the TAPR protocol.